A wise person once said, “Life is too short to wear boring clothes.” And they were right! So this season, add a little color to your wardrobe with our Flying Monkey Colored Jeans. The Flying Monkey Colored Denim offers the same style, stretch, and comfort as the regular denim, but with added style. 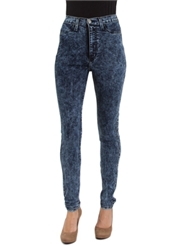 These hued jeans can be styled to fit your style and personality. You can wear the jeans to match the rest of your ensemble or to add pizzazz to a somewhat basic outfit. Either way, the splash of color from your colored denim will be the focal point of your outfit. A warm-weather wardrobe that includes bright colors can help drive away the winter blues and brighten your mood. You can pair these brightly colored skinny jeans with contrasting combinations to create an interesting and eye-catching look.